• Economic diversification; and neighborhood redevelopment. • Checklists, forms, sample plans, and resource contacts. Floods, tornadoes, hurricanes, and earthquakes happen – sometimes without warning. We cannot stop disasters from happening, but we can work to be more prepared when they do. 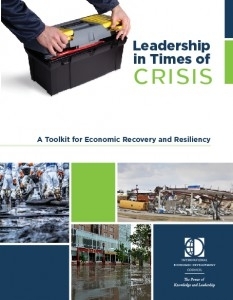 EDA and IEDC hope that this toolkit can be to businesses what bottled water, a first aid kit, flashlights and batteries are to citizens: a vital tool for survival when disaster strikes.